I kind of love April Fool's Day. It's the one day of the year that I can let my inner prankster roam free and my victims can't get (too) mad at me. I really only pulled off 2 April Fool's jokes today, kind of a slow year. Then I got an email from my friend Coleen that I thought for sure was an April Fool's. 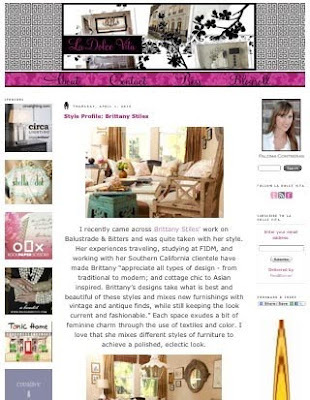 She sent me a link to La Dolce Vita who featured me on her blog today. Me? I'm not even going to try and play it cool and pretend like I wasn't beyond thrilled and surprised and act like this happens all the time, because I was and it doesn't. Paloma, thank you so so much for your kind words! Best April Fool's Day ever!